They are upon us. 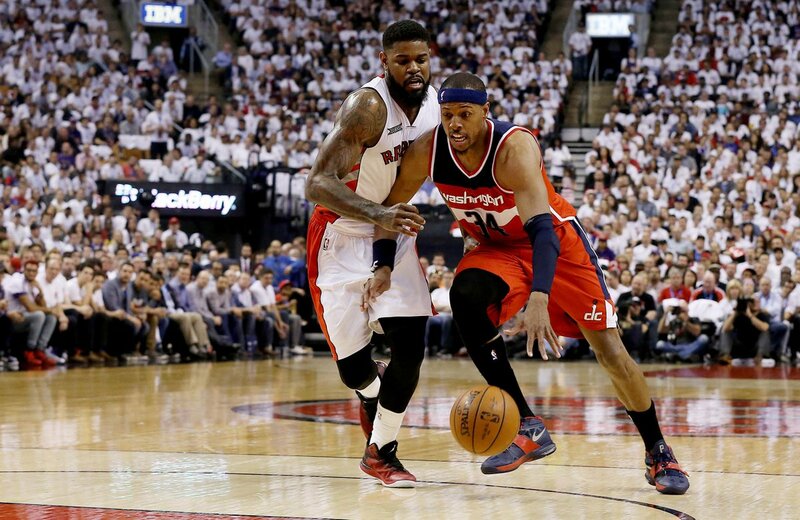 The grandure, the unpredictability and the amazing - it is the NBA Playoffs. The weekend kicked off with a splash as game 1 match ups started off on Saturday, here we give you our full game recaps. The Toronto crowd was thunderous before tip off and were ready for their Raptors to shut up Pierce and his new team the Washington Wizards. Both teams got off to a sloppy start as they were shooting bricks at the rim, it was picked up at the end of the quarter but the Raptors had more momentum going for them near the end of the period. DeRozan lead the way with 10 first quarter points. Everyone was getting involved for the Wizards as their team score 19 in the first and for Toronto it was DeRozan and Hansbrough who carried the load in the opening quarter of the game. The Raptors lead 23-19 after one. The Wizards needed to get their offense going and they did just that, they went on a 8-0 run down the stretch in the 2nd quarter and found themselves with a comfortable 5 point lead. Pierce silenced the fans in this quarter when he scored 10 of his 20 points in the 2nd. He made two three pointers & the other 4 points were pull up jumpers. Patterson was doing all he could as he scored 7 points to keep the lead but he needed help and it wasn't there in this period, the Wizards had the lead going into the second half by the score of 46-42. Toronto looked like they were putting together a run of their own but it backfired as Washington kept putting points on the board to extend their lead. Washingtons biggest lead of the game was 11 and it was cut to 5 after Johnson hit two shots and DeRozan made a layup. By Sessions scored 5 points to end the third and the Wizards had a 65-56 lead. The Wizards had a double digit lead with 5 minutes to go, it was cut down to 4 and stayed at that number for a couple of minutes, Toronto was in desperate of a three with 25 seconds left, and Vasquez drained one in to tie the game and sent it into OT. Overtime: Pierce scored 5 points in OT and he started the period off with a three pointer that set the tone for the rest of his team for the next 4:23. The Raptors scored 4 points in OT and it hurt them badly. Notable stats: Pierce- 20 PTS, 7-10 FG, 4-7 3PM, 4 REB. Johnson- 18 PTS 8-12 FG, 8 REB. Derrick Rose was back on the basketball court during the NBA playoffs and he looked better than ever! Chicago surprisingly couldn't pull away from the Bucks in the first and had a 30-29 lead after one. Butler lead the way with 11 points but Gasol and Brooks both had 6. Ilyasova had 7 as he was leading the way for his team to keep up with the Bulls. In the second quarter, Chicago had momentum on their side but the Bucks kept putting up a fight as they'd answer right back to the Bulls after they'd score a basket. The Bulls had a 10-1 run to end the second. During that run, Rose scored 4, Butler scored 4, and Gibson scored 2. In that quarter alone, Drose put up 10 points and he put his team up by 9 going into the second half. A 6-0 run was in the works for Milwaukee when they cut the deficit to only 3, but the Bulls answered right back as they scored 8 points in a row. Derrick Rose was money from behind the acr in this quarter, he made 3 threes and padded his stats by getting to the free throw line by scoring 2 more points. Middleton and Henson combined for 15 points in the third and that wasn't enough for them to cut the deficit to single digits. Chicago leads 86-75 after 3. The Bucks never got back into this game once the 4th period started, they shot 6/18 from the field in the final quarter. Dunleavy hit two threes in a row and that seemed to seal the deal with 4:00 minutes left and they jumped out to a 14 point lead. Rose and Butler were to much for the Bucks backcourt and the bigs for Chicago didn't play very good, they played well. 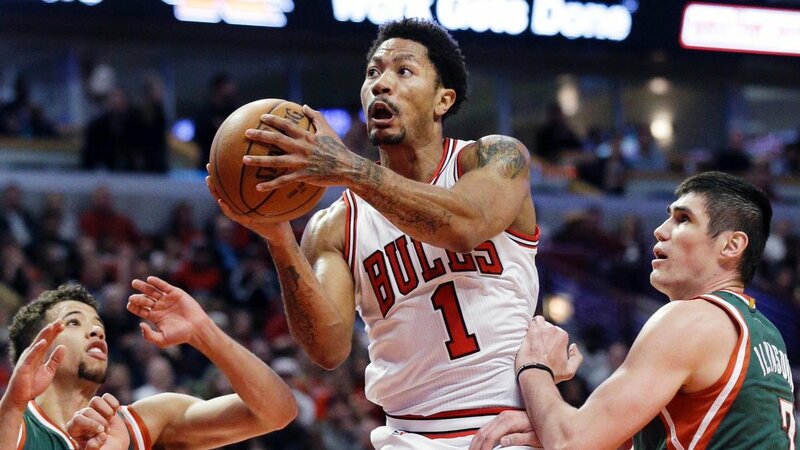 Notable stats: Rose- 23 PTS, 7 AST, 9-16 FG, 3-7 3PM. Butler- 25 PTS, 6 AST, 8-14 FG, 2-5 3PM. Middleton- 18 PTS, 4 STL, 7-17 FG, 2-6 3PM. Kyrie Irving & Kevin Love are making their playoff debuts and they didn't disappoint, the King was back home where he belongs and city of Cleveland was back in the playoffs. Boston was aggressive early & actually had the lead after the first. Tyler Zeller scored early and quickly, he had 6 points in the first 4 minutes. Olynyk and Thomas came off the bench for this one and shines early, they combined for 16 points and their team was up 31-27 early. Lebron started slow, he was frustrated in the early going but Kyrie looked great for his first playoff game as he scored 8 of his 30 in the first. James had 5 and JR had 6 after one. We call him "uncle drew" Kyrie Irving scored 12 points in the second quarter was magnificent as he put on a show before halftime. Lebron drove to the basket so easily and efficiently in the second, he scored 8 and he's could drive to the rim all day if he wanted to. Love got into the action as he scored 6 points after he started off really bad, Thompson scored 4 before the half and was grabbing offensive rebounds like he normally does so easily. Extremely hard to box that man out. Kyrie hit a 3 at the buzzer to extend the Cavs lead to 8 to end the half by the score of 62-54. This is where Cleveland put the game away, the Cavs collectively as a group shared the basketball and everyone was involved in scoring, 21 points was how many the Cavs scored in the third that put them up by 15 going into the 4th. Bass and Thomas combined for 11 in the third. There wasn't a lot of action in the 4th, the Cavs already had the lead locked in but looked to extend it a bit more. They scored 22 points in the fourth and won by 13. The Celtics didn't play bad, they played pretty good but it's just not good enough to beat the Cavs. Notable stats: James- 20 PTS, 7 AST, 6 REB, 8-18 FG, 1-3 3PM. Irving- 30 PTS, 11-21 FG, 5-9 3PM. Love- 19 PTS, 12 REB, 4 AST, 5-14 FG, 2-4 3PM. Thomas- 22 PTS, 10 AST, 5 REB, 6-14 FG, 2-5 3PM. The well rested Hawks looked to take on the Brooklyn Nets at home during game one. The Hawks started off energetic and fast as they scored 32 points in the first quarter and jumped up to a 12 point lead after the first. Carroll scored 7 in the first and led the way with scoring for his team. Jarrett Jack had 6 and and Lopez scored 5 to kick things off. The crowd in Phillips Arena were going crazy for their team as they looked so good in the opening quarter. The Nets kept trying to get back into the game but once they did Atlanta had an answer for them after every bucket. The lead was cut to 10 but it stayed there during most of the second. Korver scored 7 and Caroll score 5 in the period. In the beginning of the 3rd, Brooklyn went on a 8-0 run to cut the lead to only three points! But the Hawks pulled away after they had a 10-0 run. 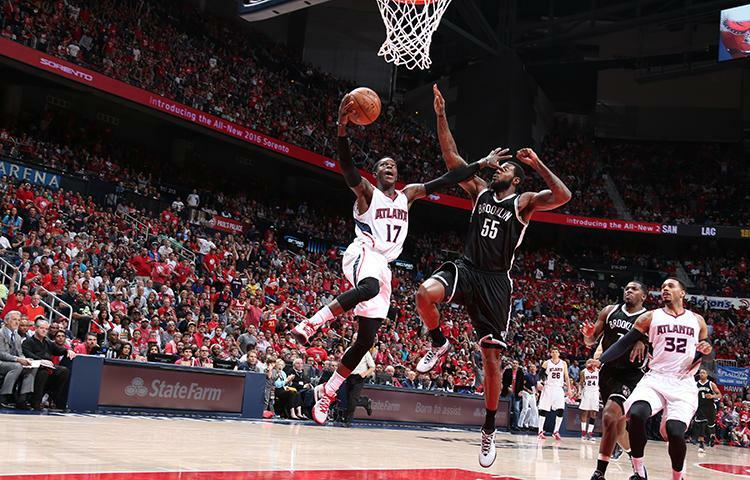 Three 3 pointers helped Atlanta pull away from Brooklyn. Williams had himself a 6 point third quarter and he scored all but two points during the 8-0 run. The Nets went on another run and this time it was a 7-0 run that put them only down 7 with 6:11 to go. The Hawks pulled away, but Brooklyn was down by 5 with 55 seconds left, but a Williams three pointer missed and the Hawks sealed the deal off Teagues free throw. The Nets can win this series, it's just the way they started that killed them because they were playing down the whole game. Notable stats: Korver- 21 PTS, 3 AST, 7 REB, 6-12 FG, 5-11 3PM. Lopez- 17 PTS, 14 REB, 6-7 FG. Golden State has the best record in the NBA, they would face Anthony Davis in company as his Pelicans looked to pull up and upset in Oracle Arena. Curry was unstoppable in the opening period, he scored 11 points and hit only one three pointer. Harrison Barnes scored 8 and he was on a roll by hitting 2 three pointers and a put back dunk. Davis was shut down in the first, he only scored 2 points and was 1-4 from the field and had 2 turnovers. The Warriors jumped out to a 28-13 lead in the first. At a point, the Pelicans were down by only five points with 3:57 to go but Golden State went on a 15-1 run to end the quarter and go into halftime with a 18 point lead. Curry scored 8 points and Thompson shined in this quarter with 11 of his own. Davis scored 9 but the Pelicans lost Tyreke Evans because of a knee injury, he would not return but his knee is fine and will be good to go for game 2. Warriors up 59-41 at the half. Golden State were up by 25 mid way through the third quarter, they ended up with a 18 point lead after three. Curry and Green both scored 8, Pondexter has a great third quarter he scored 10. Davis had 4 and Gordon scored 5. Davis scored 20 points in the 4th quarter and his team cut it down to four with 8 seconds to play. They made a huge run and they can learn from that, Gordon and Holiday both put up 5 in this period and they just couldn't get the deal done in game one. Notable stats: Curry- 34 PTS, 5 AST, 4 REB, 13-25 FG, 4-13 3PM. Thompson- 21 PTS, 3 AST, 6-17 FG, 3-6 3PM. Davis- 35 PTS, 7 REB, 13-23 FG. 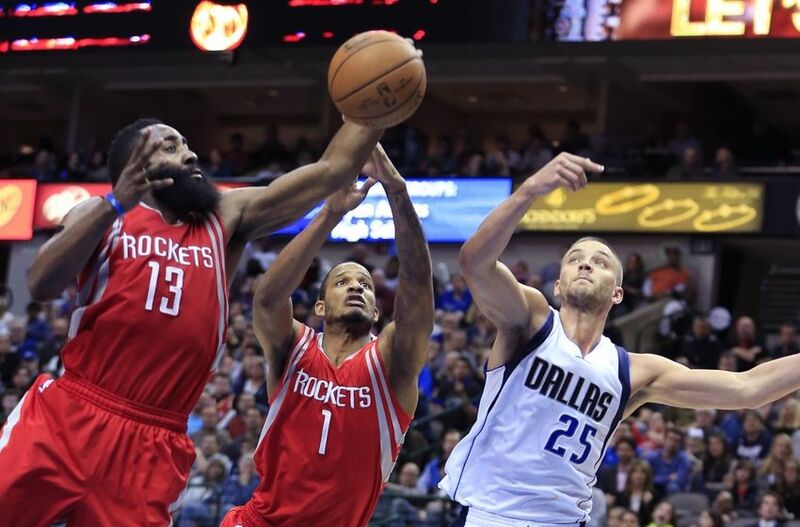 The MVP candidate James Harden looks to lead his team to a game one victory over the in state rival Dallas Mavericks. Houston got off to a fast start as they were up by 13 after one. Harden scored 8 & Terry scored 7 as they were catching fire quickly. For Dallas, they couldn't find their rhythm and it hurt them early. Monte Ellis scored 7 in the opening period and he couldn't do it all by himself as he was looking for help along side him. Dallas finally found rhythm in the second quarter as they actually had the lead at one point mid way through the second. The Rockets kinda pulled away after escaping that comeback from Dallas. They had a four point lead going to the locker room. Josh Smith scored 8 and he helped a lot coming off the bench. Jones scored 10 and Ariza scored another 5 but Harden had a slow second quarter and that's why I think they fell apart. Rondo and Dirk both had a phenomenal second quarter as they combined for 19 points. Chandler contributed to score 7 and now they had momentum all as a team. Both teams traded off baskets and there was a lot of back and forth action going on. Houston was up 84-77 after three. No one really blew up in the fourth, the Rockets as a team all contributed to put the ball in the net and it was like they were taking turns of who gets to score next. They had a strong showing in the second half and responded to the Mavs comeback. Notable stats: Harden- 24 PTS, 11 AST, 4-11 FG, 1-5 3PM. Nowitzki- 24 PTS, 8 REB, 10-14 FG, 1-1 3PM. Well, the start to this one was very ugly for one team. But the Blazers did not have Affalo in the lineup tonight so CJ McCollum would be in the starting lineup. Portland started off 1-10 from the field in this one, they had a terrible start which is why they got beat badly. Lillard was just a brick house tonight and it was not fun to watch, Aldridge had 8 points in the first but he was 3-10 in the first which was just horrific. 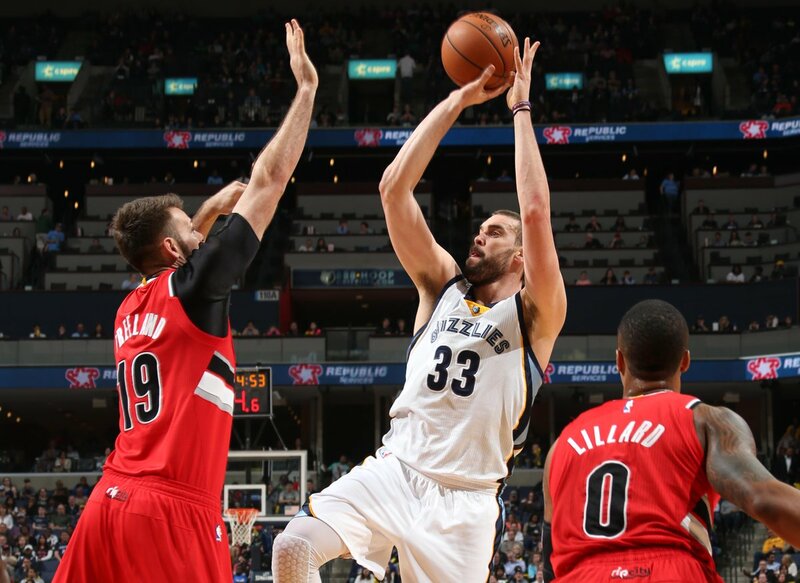 Udrih coming off the bench had 8 points in the first and he was the guy for Memphis who helped them pull away from the Blazers. Gasols jump shot was so deadly tonight as he scored 7 points. This is where the ugliness begins, Memphis ended the first half on a 14-4 run after Portland cut the deficit to 9. For Memphis, it was guys from the bench and the starting lineup that all had parts in scoring during their big second quarter. Memphis just kept scoring and the Blazers couldn't go on a run to make it a little bit closer. At the end of the third it was 86-62 Grizzles. Portland scored a lot in the fourth, but they were down by way to much to cut the lead down to single digits. The way Portland started hurt their confidence, it also hurt them because they were playing down the whole game and Portland isn't used to that most of the time. Notable stats: Udrih- 20 PTS, 7 AST, 7 REB, 9-14 FG, 1-1 3PM. Gasol- 15 PTS, 7 AST, 11 REB, 7-16 FG. Aldridge- 32 PTS, 14 REB, 4 BLK, 13-34 FG, 2-5 3PM. Lillard- 14 PTS, 3 AST, 8 REB, 5-21 FG. This was the last game of the weekend and it wasn't so close as expected. The Clippers played a great game behind their home crowd. The Clippers got off to a hot start in the first as they went up 30-18 after one, the crowd in the staples center were fired up as their team had the lead and a lot of momentum on their side in the first. Griffin scored 9 and Paul scored 5, everyone was involved and it was a good sign for Doc Rivers and his team. The Spurs went on a 10-0 run to begin the second and cut the lead to two points. They eventually took the lead but LA pulled away, but late in the second Popivich called for his team to foul Jordan since they were in the penalty to shoot free throws. He went 4-8 which isn't bad, Lenoard scored 6 in the second and now the Spurs were back at it and were down by 6 at half. The Clippers were on a roll in the third, Griffin took flight and had two absolutely stellar dunks over Baynes who got thrown around in the third quarter. Paul exploded, he scored 13 of his 32 as he drove to the rim so well in the third. As for San Antonio, they just weren't hitting shots. They kept it close throughout the third until the Clips closed the quarter on a 22-11 run. The Spurs brought it back to a single digit deficit with 7:33 left. But again the clippers went on a 10-1 to really close the game. Paul was sensational in the fourth, he hit two three pointers and scored 11 in the last quarter. 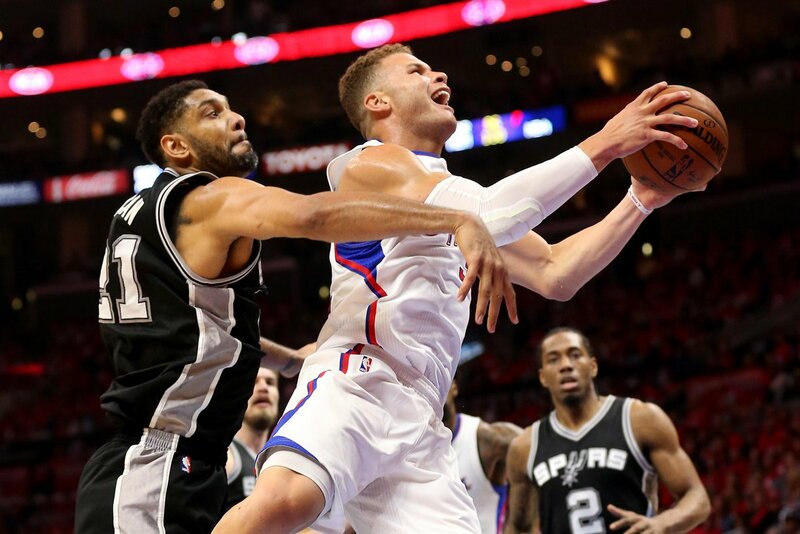 The Spurs couldn't really stop him and Griffin from scoring and they shut the defending champs down on offense. I think Pop has a lot of work to do on the defense of side of the ball, his guys couldn't really do anything against LA to stop them on offense and that's a big problem, on offense they couldn't hit shots and I think they were pressured to much to win game one. Notable stats: Paul- 32 PTS, 6 AST, 7 REB, 13-20 FG, 3-5 3PM. Griffin- 26 PTS, 6 AST, 12 REB, 3 BLK, 9-20 FG. Leonard- 18 PTS, 3 AST, 6 REB, 7-12 FG, 1-2 3PM. The first batch of games are done and dusted. The basketball will continue to flow and give us many more amazing moments. 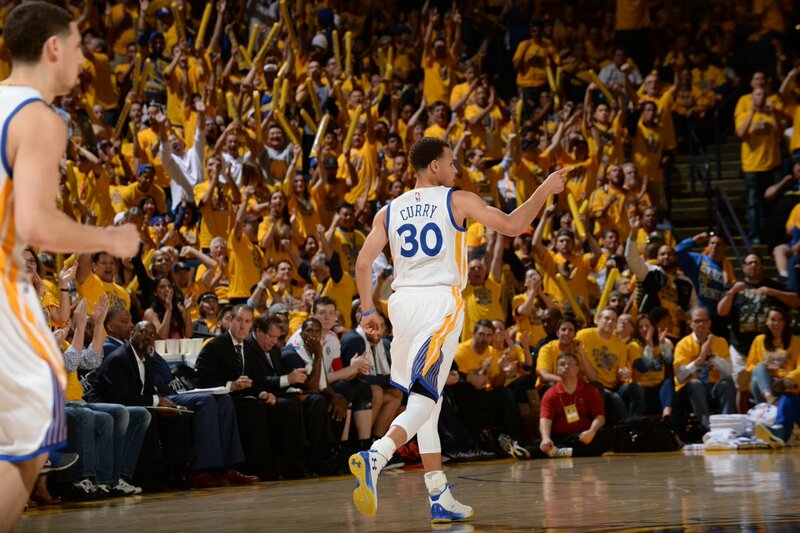 A comprehensive roundup from the 2015 NBA Playoffs Game 1, Round 1.